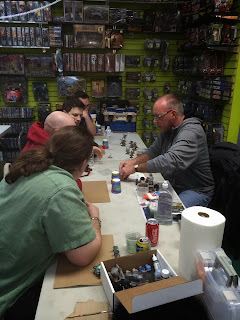 This past Thursday evening, I drove over to the LGS and put on a basing workshop. I had a lot of fun, and it seems that the guys involved enjoyed themselves. This lineup of Cygnar Rangers and a few solos shows the steps involved in basing a figure. From left-to-right, the steps are: 1) figure glued to base, 2) glue sand to base, 3/4) prime and ink-wash the figure, 5) paint dried sand dark brown, 6) drybrush sand orange-brown and off-white, 7) go ahead and start painting your figure, and 8) when the figure is done and sealed with Testors Dullcoat (and the outer rim of the base is painted black), then glue on some static grass. I've detailed a similar method with an already-painted figure in this post. I only finished off one model this week, Kell Bailoch. He's a pretty popular sharpshooting Warmachine solo. When I started working on him some time back, I had inadvertently "snowed" his primer coat. The only way to save the figure was to use dark colors and hope no one gave it a really close inspection. Well, here's an embarrassingly short battle report. Elliot came over Tuesday night for a game of Warmachine. He brought a pBaldur list, while I trotted out the Harbinger (first time in about 4 years). I rolled up "Close Quarters," and you can see the flag placement on the table here, along with the opening set ups. I'm Menoth on the right. Elliot is Circle on the left. My list consists of Harbinger, Hierophant, two Reckoners and a Devout in the battlegroup. Then the rest of the list is Avatar, Choir, Vassal, Vilmon, Covenant, Rhupert and Errants with UA. I've rolled to go first. 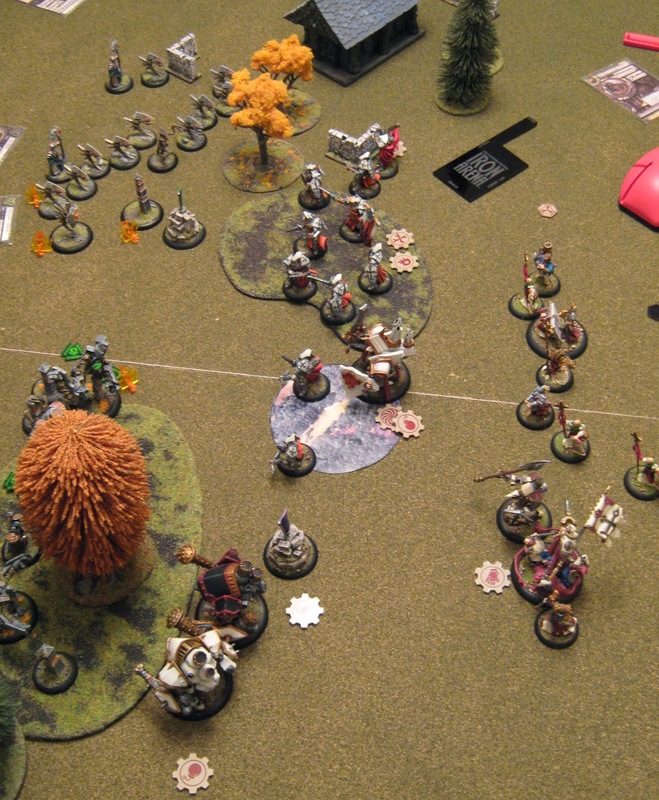 Elliot is playing the pBaldur tier list, with Megalith, Wold Guardian, Woldwarden, Woldwatcher and Woldwyrd in the battlegroup. Then he had two units of stones (one UA), Mannikins, two units of Woldstalkers and a Wilder. Elliot goes second. Menoth turn 1. So here's the crux of the game...we're playing a scenario with Kill Box, so I'm forced to move up with Harbinger. Elliot is playing an army with lots of Advance Deploy, Advance Move and plenty of place effects. He's up close right out of the starting gate. I've set up Harbinger on my left to go after the friendly flag. I feat on the top of turn one just to give me a chance to move up my line of engagement. I move up my Errants on my right flank with flame attacks (from the Covenant) and Tough from Rhupert. I want to start the attrition early...but I miss all my crossbow shots by about a quarter inch. Hmmm. Circle turn 1. Elliot shifts all of his 1-hit units away from the feating Harbinger, and starts shooting at my Errants (he kills 3) and Vilmon (who I Martyr twice). A couple of Mannikins turn into trees (as you can see, Elliot made some great templates for them). On my left flank, opposite my battlegroup, Elliot moves up his heavy hitters. He takes a few points of damage from the feat, but gets some Earth Spikes off on a Reckoner, knocking out its gun. 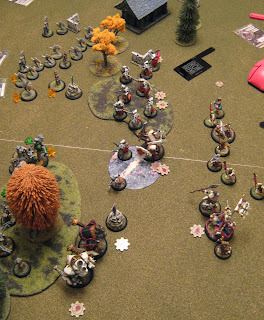 Baldur teleports into the forest in front of me (that's bad news). Menoth turn 2. I load up my Reckoners to take out Elliot's Wold Guardian with Crusader's Call. Avatar moves up and Gazes, in an effort to pull the heavies away from Harbinger. Errants set stuff on fire. Circle turn 2. And...it's the end of the game. Megalith stone-teleports up (avoiding Gaze effect) and puts DEF debuff on Harbinger. Then Baldur tree-teleportsup to Harbinger (no Defensive Strike from Devout) and uses his 4 Fury to beat Harbinger into the ground. Well played Elliot! Well...not to entertaining to read about...this was a pretty standard pBaldur assassination run, and the Kill Box scenario played right into his hands. Oh well...it's fun to get some old miniatures out onto the table anyway! So, my last project for our local Journeyman League was a large unit. The requirement was to paint a unit of at least 10 figures. Well, I had Alexia and the Risen sitting around. Now, Alexia starts the game with 9 Risen in play...but she can accumulate up to 20 by gathering corpses. The box set comes with 10 undead, so I figured an interesting project would be filling out the rest of her Risen with spare undead models I had sitting around from Mantic and Lord of the Rings. Then, adding in a couple of her Thrall Warriors, I was able to submit a 23-man unit for the last painting challenge in the league. And, here they are...Alexia and the Risen. Now, there are a lot of skeletons in this unit, so I'm going to take this opportunity to add a skeleton painting tutorial into this post. First off, skeletons are fun and easy to paint. Step 1. After assembly and basing, prime white and add a dark wash. Step 2. Apply a very thin layer of dark bone color. I use the Reaper bone shades...starting with Bone Shadow. Step 3. Build up layers of lighter colored bone shades (Aged Bone and Polished Bone in this case), and then blend all the layers together with a sepia wash. Step 4. I applied the last bone highlight layer later in the painting process...actually, it was one of the final steps. I was trying to gage how much I needed the bone color to pop out on the game table after I had the rest of the figure painted. Anyway, the final highlights were painted on with a very thin layer of ivory. As always, you want to just hit the raised features with your highlight layer. This enables the stark bone to really be visible on the tabletop. Step 5. In any event, back to the rest of the figure. After the initial bone colors are down, I moved on to metal. This is a layered process as well. Shadowed Steel goes down first...then a careful drybrush of Chainmail, followed by a wash of Umber. Step 6. After the wash dries, a final highlight of metal is drybrushed on (Chainmail and Mithril Steel from the old GW line of paints). Step 7. Last comes the clothing and leather. I chose red cloth for the figures, to give them a unified and ominous look. All the belts, collars, boots etc. got hit with leather brown. The reds and browns were layered as well to add as much depth to each figure as possible. Then finished the basing, and that was that. Here is Alexia with the 10 Risen that come in the box. I did some head swaps to add variety to the limited number of poses. And here are the additional 10 undead figures...most are Mantic skeletons, but there are a couple of Lord of the Rings figures in there as well. I also did two Thrall Warriors, as Alexia has the ability to generate one of these solos per round. For our Journeyman League we were also challenged to paint a unit attachment. So, I did a quick Gun Mage Officer figure for Cygnar. All in all, a pretty productive week at the hobby table. The Blackfrost Shard is Legion of Everblight's 3-man character unit. Again, I was painting this week for the Journeyman League's painting challenge. All shard members can cast Ice Bolt and Ice Cage, and are weapon masters with magic claymores. Here's a closer view of Rhylyss. Among the standard Blackfrost abilities, he can cast the Kiss of Lyliss damage buff. This is the unit leader, Sevryn, who has the Disbinding special ability. And finally, there is Vysarr, who gives the unit Stealth. The stretch goal for this week's painting challenge was to prepare a 50mm objective marker. Again, I used a piece from Scibor miniatures' Dwarf Ruins set. Makes a good monolith objective. Next up...Alexia and the Risen. A great thing happened this weekend for the Edmonton Warmahordes community. Mike, Josh and Garnett (seen in this pic from this afternoon, from left to right) decided to take it upon themselves to start a discussion with our Warmahordes community on how to improve the Edmonton-area meta (essentially, the competitive calibre of local players). They held their seminar at the LGS (Thunderground, up in St. Albert) and broke the ice for an audience of 8 or so, talking about subjects like threat ranges, list building and playing for scenario points. There is already a very, very strong, competitive community based in Red Deer, about 90 minutes south of here, and another down in Calgary, about 3 hours away. Edmonton has lagged behind, and it's great to see some of our good local players getting guys to think about how to improve their game. The Thunderground Steamroller tournaments usually draw a strong field of 20-30 players from across Alberta, and on league nights, it's not uncommon to see two dozen guys show up. With such a thriving community, there's every reason to believe that national-level players will emerge from Alberta. Thanks once again to Mike, Josh and Garnett for getting everyone to think in a more competition-oriented way. So the painting challenge in our Journeyman League this past week was to complete a Heavy and Light Warbeast. I've already posted the Ravagore...but I just finished off the Teraph. Kind of a sweet figure. I like the sculpt a lot. Kind of a dragon-dog crossed with a Giger alien. Next week's challenge is a 3-man unit and a 50mm objective. Comin' up! The Best Day of the Year Happens EVERY Year! As long-time followers of this blog know, my favorite day of the year is "fall back day," where we go from Daylight Savings Time to Standard Time. I always invest the extra hour into painting...and this year was no exception. This week's painting challenge at the LGS's Journeyman League requires a Heavy Warjack or Warbeast. I'm playing Legion of Everblight at the league, and don't have a Ravagore in my arsenal yet...so here it is. I put the extra hour today to good use...putting skin texture into this beast, and finishing the mouth and teeth as well. If you play Hordes, you know that the Ravagore is something special. Lots of hitting power and a great animus. I found the pose of this beast tilting a little to much downwards for my liking, so I built up the base with some cork and tipped the whole figure up. The Ravagore now takes his place alongside my other jungle-themed Legion heavy 'beasts...as well as Epic Thagrosh, who feels like a heavy 'beast as well! As you can see, my Legion theme is part organic and part metallic. I was always fascinated with dragons described in literature as having "claws of steel" or the like. All carapaces, horns, teeth and claws on my heavies are metal.